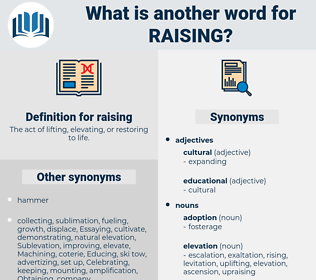 What is another word for raising? The act of lifting, elevating, or restoring to life. increasing, increased, Lifting, Heightened, Enhancing, strengthening. cancels, increasing, leads, pushes, raised, seeks, sues, increased, Lifting, increases, improving, Enhancing, Its, strengthening. 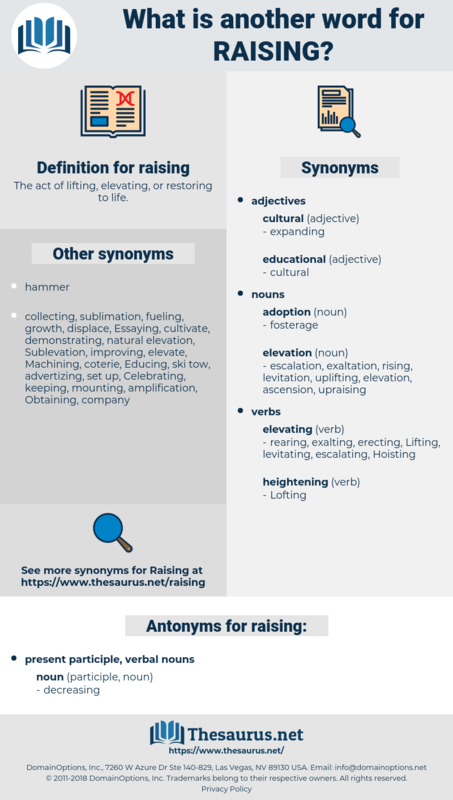 takes, increasing, increased, Lifting, improving, leveraging, Enhancing, stockbreeding, stockfarming, Hoisting, keeping, strengthening, child-rearing, Levying. Brought, put, focused, focusing, improving, Enhancing, Its. Arising, Arousing, organising, sensitising, emphasising, re-establishing, purchasing, acquiring, exercising, disclosing, demonstrating, withdrawing, disseminating, Proposing, ameliorating, restructuring, imposing, Eliminating, Sharpening, Restoring, Activities, Exposing, accelerating, Rehabilitating, Incorporating, childrearing, exacerbating, increments, Elevating, Instigating, Consolidating, orchestrating, Measures, Extricating, asserting, stirring, sparking, intensifying, triggering, Describing, wearing, deriving, Delivering, representing, rallying, catalysing, circulating, Cultivating, Expressing, speaking, Indicating, Attracting, Retrieving, Assessing, aggravating, understanding, Bolstering, inflaming, maximizing, Introducing, Enriching, reviving, contributing, Furthering, recruit, spreading, Pertaining, Empowering, Organizing, Instituting, Receiving, Responding, Considering, provoking, Concentrating, Soliciting, Constituting, Enlarging, Declaring, Presenting, Choosing, verhoging, Abolishing, Extracting, Constructing, enlisting, ensuring, supporting, Eliciting, Suggesting, suffering, arranging, Mentioning, being, showcasing, installing, diminishing, Selecting, Amassing, reporting, Capturing, instilling, Elaborating, Transferring, publicizing, concerning, assuming, galvanizing, leading, erecting, upgrouping, Reaping, leaving, identifying, Discussing, informing, transmitting, Formulating, alerting, Dispelling, Procuring, Specifying, serving, servicing, Attaining, borrowing, Preparing, Igniting, subsiding, consequently, Examining, undertaking, reconvening, Acknowledging, emerging, sitting, Debating, reminding, Advocating, recovering, L, riding, stripping, performing, Expediting, detailing, Realizing, Inciting, seeking, Invoking, resolving, Treating, governing, Enforcing, Possessing, Exhibiting, Experiencing, Adjourning, closing, communicating, exciting, Requiring, Maintaining, pursuing, confronting, Influencing, Involving, Gaining, Amending, Canceling, Cancelling, comparing, incurring, driving, reuniting, abiding, solving, opening, highlighting, Relating, Managing, becoming, Subjecting, advancing, Containing, asking, developing, unleashing, rendering, Adjusting, embracing, Deploying, climbing, inviting, merging, Spawning, regarding, regards, Carrying, lying, sponsoring, drawing, Postponing, piling, reaching, yielding, returning, Emanating, Granting, designing, Adding, publishing, Citing, Toughening, Alleging, Stating, surrounding, updating, catalyzing, Announcing, Fomenting, curing, Undergoing, exceeding, resulting, work, hardening, reflecting, pushing, Recommending, deciding, denounce, Denouncing, saying, Stepping, uniting, fueling, fuelling, belonging, convening, Outlining, pointing, Evoking, Peaking, Checking, forging, travelling, sending, featuring, coming, Fleshing, Referring, tackling, Channelling, Embodying, Throwing, positioning, listing, changing, helping, flying, Requesting, requests, drafting, doubling, dropping, standing, staging, casting, showing, approaching, laying, Adopting, concluding, conveying, combining, ec, prompting, upholding, Fanning, dealing, falling, passing, shooting, picking, covering, aligning, stoking, Totaling, Totalling, according, Implying, joining, launching, waking, jacking, waving, Aiming, grouping, packaging, grooming, Allowing, speeding, finding, Producing, opinion, planting, K, edging, Permitting, coping, Noting, U, looking, Plotting, Claiming, calling, Forming, place, Placing, places, Hosting, paying, winding, focusing, focussing, takes, Pumping, Pooling, talking, meaning, shifting, Linking, touching, effects, Effecting, connecting, Amounting, going, getting, affecting, letting, 2003, eleven, killing, accounting, acting, heightening, Lifting, improving, leveraging, Enhancing, Hoisting, keeping, strengthening, Levying. elevates, fosters, contributes, promotes, grows, run, improving, Enhancing. arouse, heighten, augment, improving, Enhancing, adjourn, waive, withdraw, inflate, terminate.
" Good little Peggy," he said in a low, quiet voice; and then, raising his head, he looked at her intently with his brilliant grey eyes. Then raising herself with a last dying effort, she cried aloud, Hear, all!